How is it Friday already, crazy, more over how is it nearly the end of the year even crazier! New year resolutions are quite simple this time round, get a better work/life balance (pretty sure that is not going to happen)Â collect more art, re-do the bathroom (hate it) oh and go do Pilates and swim for 2 hours a day (right). Told you they were simple. The art thing I am serious about, I’ve neglected it a bit which is incredibly lazy of me and yet itâs so transformative. You don’t need a big budget to get some seriously cool art, I’ve picked up some fabulous finds at auction houses and vintage shops you just need time something I never seem to have enough off, but I’m making time. 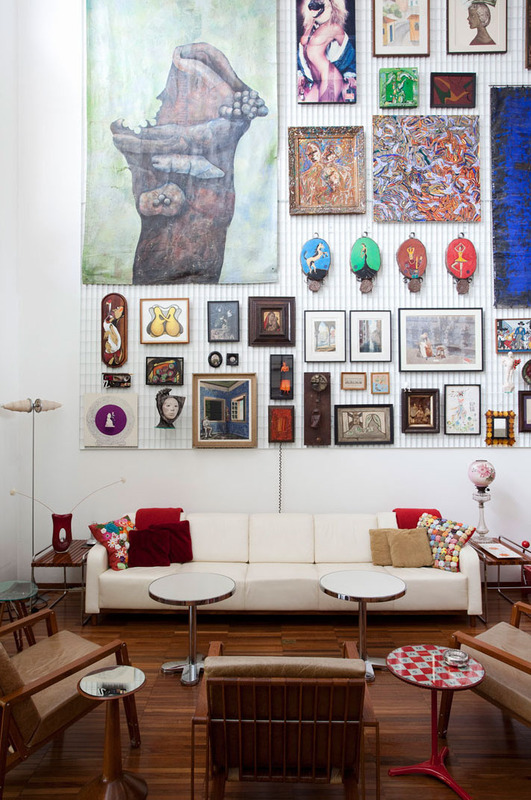 Katie and Andy Spades pad in NY which I have shown a zillion times is full to brim of art, expensive art, cheap art, flea market art you walk into anyone of their rooms and you immediately want to linger longer and take it all in. In my early days of living here I had nothing on the walls not a thing – my life is so chaotic I want to come home to a neutral calm space I remember telling someone. What a load of BS in other wordsÂ I have no idea where to start and itâs easier to make myself believe I want a calm neutral space than step out of the box and push things. I look back now at the images of our house white and I honestly shudder, so bland, so boring what was I thinking? Actually I wasnât thinking I hadn’t yet converted across to the dark side and I had no idea how addictive it was.Â Once you start daring to be different there is no going back, back then in the white minimal days I didn’t put the key in the door and smile or feel my spirits raise on walking thru I didn’t think anything. These days the moment I am thru that doorÂ some kind of magic envelopes me, no matter how tough the day its a bit like taking aÂ massive glug of whisky suddenly I feel mellow and contended. Anwyas I digress, even if you start in a small way with the odd print or flea market art find banged up salon style (aka higgledy piggledy) in a alcove see what happens. You’ll be drawn to it the minute you enter the room, and then imagine another alcove or blank wall with some other art, way hey before you know it youâve created some darn cool focal points, tantalised the eye and raised the spirits. Easy no? An image to inspire as all to collect more art. Have a lovely weekend – for us Borough market, potter along the south bank maybe a Royal Park for the two M’s oh and I fancied Notting hill but thatâs pushing it in a day.